Done up in a sunny shade of yellow, this wood-frame Queen Anne home dating from 1893 is surrounded by an appealing courtyard and gardens. Indoors, the parlor has parquet floors and is furnished with some proper Queen Anne pieces, but much is simply old. The parlor fireplace is a focal point, and it is fun to open the tall windows and step onto the veranda; many guests take their breakfast here among the rockers and ferns. All rooms are exceptionally large, but the best are No. 7 (with its black floral fabrics and fireplace), No. 5, and No. 9. Children and pets are allowed only in the cottage out back, which is not as well furnished as the main house. YOU SHOULD KNOW Children 12 and older are welcome in the main house rooms. Children of any age are welcome in the cottage. 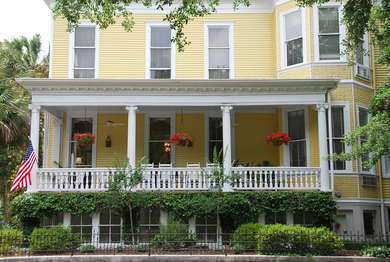 The property offers 11 rooms and a cottage on the premises; all are unique yet cohesively retain elements of Victorian style. 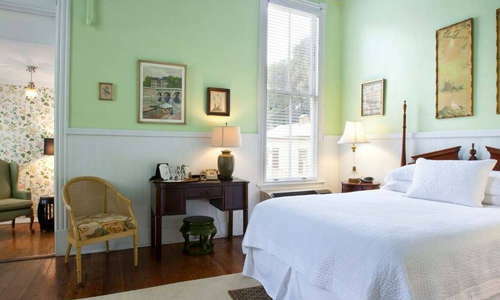 The views from all rooms are delightful; an easy feat, as this is one of Savannah’s most beautiful neighborhoods. The beds are exceptionally comfortable, with fine linens to boot. YOU SHOULD KNOW The main building is generally pet-free, yet exceptions may be made by approval for rooms 10 and 11. The cottage always allows pets. The bathroom facilities are bright and airy, with attractive wallpapering, wainscotting, and tiling. They are kept spotlessly clean. The entranceway of the house leads quickly past the foyer, back to the parlor, where a beautiful fireplace welcomes a weary traveler on a cool night. Gorgeous floor-to-ceiling windows give fine views of the extensive veranda, which looks out onto Savannah’s famous Forsyth Park. Breakfast is available starting at 8:30 a.m., featuring their specialty buttermilk pancakes with Georgia pecans. 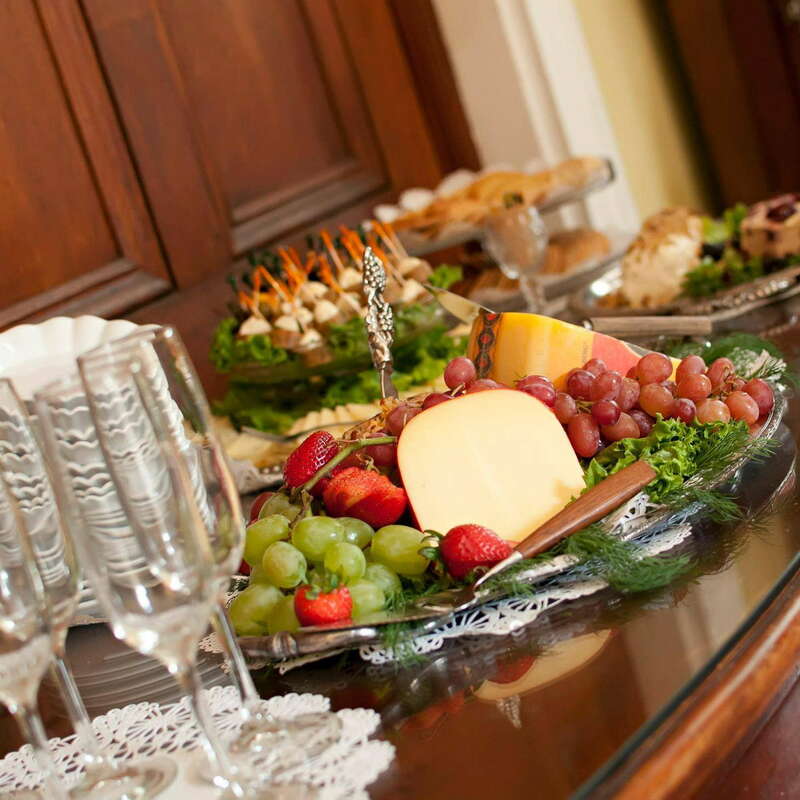 Fresh fruits, savory meats, and egg dishes are also served. 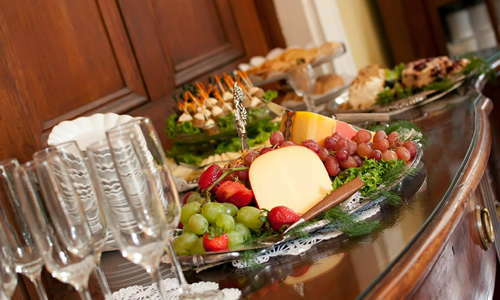 Afternoon appetizers also vary by day. Dessert and tea are served at 8 p.m. Grab a to-go cup of coffee at the Sentient Bean in the morning before the weather warms up and stroll up to one of the park benches that surround the Forsyth Fountain. Complimentary wine is served around 5 p.m.
Sandfly BBQ (8-minute walk) easily reigns as one of the top two barbecue options in this BBQ-loving city. Local 11 Ten Food & Wine (7-minute walk) is an elegant fine dining option nearby. Dine, by candlelight, at marbled tables, on a varied seasonal menu. Stop by the Mirabelle Cafe (14-minute walk) in the morning for waffles and coffee. Into the rooftop bar action? Perch (6-minute walk) is the mid-scale rooftop bar over Local 11 Ten Food & Wine. The tree-canopied surroundings are almost as intoxicating as the craft cocktails. For unpretentious, laid-back revelry, check out the American Legion Bar (6-minute walk). Locals, college students, and tourists all flock to this quirky dive bar for cheap drinks and the 1950s-style diner, Betty Bombers, hidden behind it. 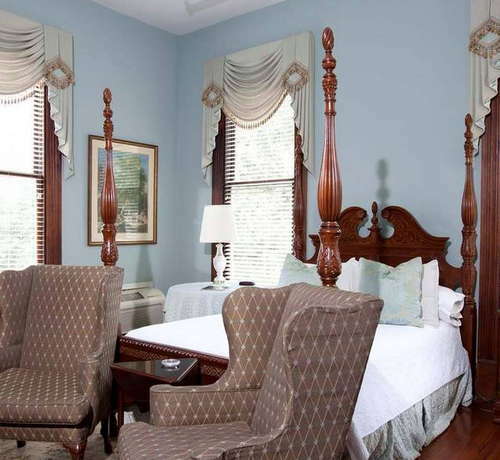 Stately and genteel, this place has the best views of gorgeous Forsyth Park out of any of Savannah’s B&Bs.